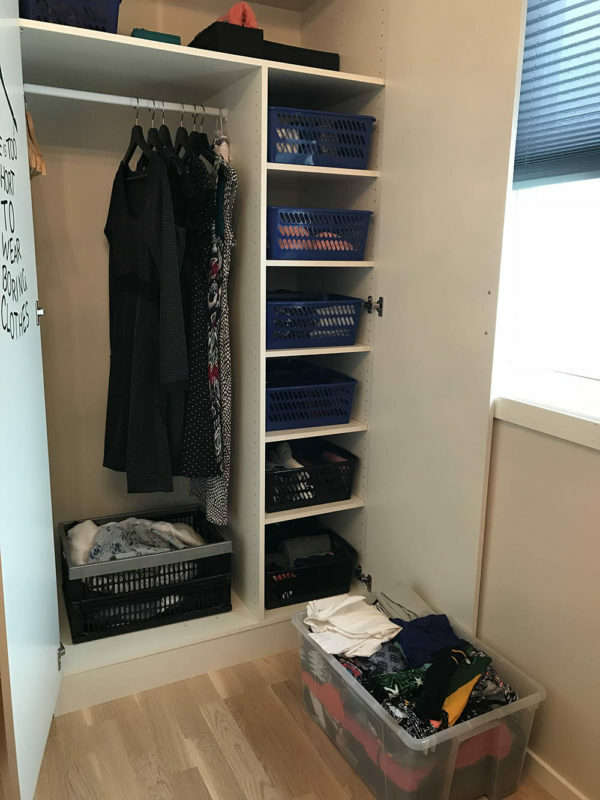 I am so excited that I have started the KonMari 26 week challenge. I have finished week 4 and so far I am so happy with my progress. These two weeks took forever. The category was so big and I had so much else going on I was slightly worried I might not finish in time. It did not help that my week 3 of the sewing challenge was taking up so much of my time as well. Vision: My vision for my bedroom is to have a clean and tidy space for me to relax. My vision for my clothes is to not only love what I have and what I wear, but to also switch out my wardrobe to contain more items that I have made myself than items I have bought in a shop. Here is a before photo of my closet. I gathered all the clothes from storage as well, which is the items on the side. I have most of my clothes here, except my outerwear and not-in-season clothes. I know that in the book, Maria writes about how you should not have your wardrobe split in two. I think she is wrong, and this is why. The weather goes from -10 to 30 degrees celsius (14 – 86 f). We only get a few days on each end of the scale, but still. I will not wear my big winter jacket in the summer and I will not wear my bikini or short in winter. Colours – I love wearing darker colours in winter and lighter colours in summer. It is my mood. In winter I wear burgundy and army green and in summer I wear mint and coral. I wear a lot of thick sweaters in winter and dresses in summer. When the weather gets warmer I love it when I am able to change my wardrobe to summer and bright colours. When the weather gets colder I love bringing out my thick jumpers and dark colours. I only have a small closet. Here is an after photo of my closet. The box is for my out of season clothes. I am really happy with managing to keep only a small box of out of season items, but I think maybe I need two for my winter things, since there are some thick jumpers and not to mention my huge winter jacket. I kind of forgot to take most of the before photos. Jewellery is really sentimental to me, so this is something that I have decided to push back to the sentimental category. I did do shoes. This was such a hard category for me as well, because I love shoes. I manages to only to get rid of five pairs – two of which I have been thinking of getting rid off for probably at least five years, because I never wear them, but they are so pretty. It remains to be seen if I will be able to get rid of them now. Vision: My vision for the library is to have a tidy place to relax, do my miracle morning, enjoy a good book and drink a cup of tea. My vision for my cookbooks t to have an organised space easily accessible so I can experiment in the kitchen with new recipes. 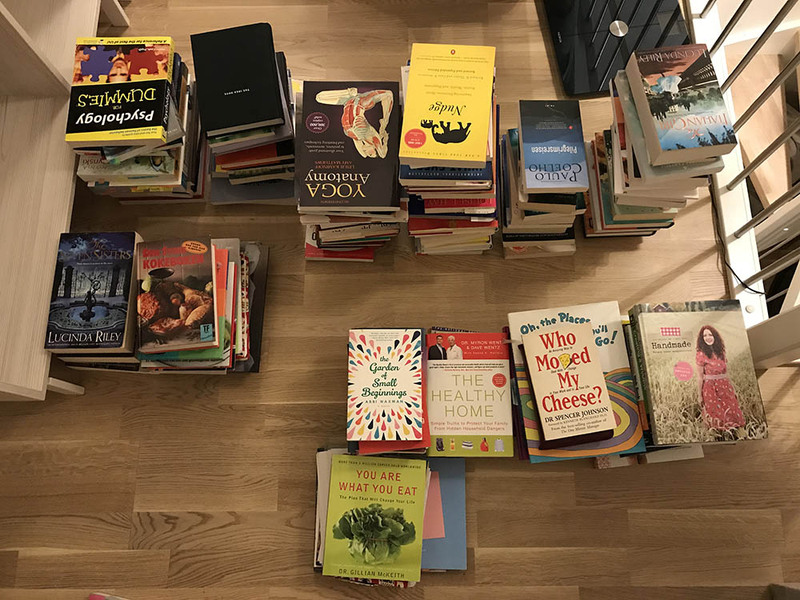 Here is a before photo of all of our books. I got my sister to join me on this challenge. So the photo of our books include both of ours (she has the most). We started by collecting all our books from all over the place. I tried to do it by category as much as possible. Here is an after photo of my books. The books at the bottom are mine, on the left is our shared books and on the top is my sisters books. She has a lot. I told her. Many times. 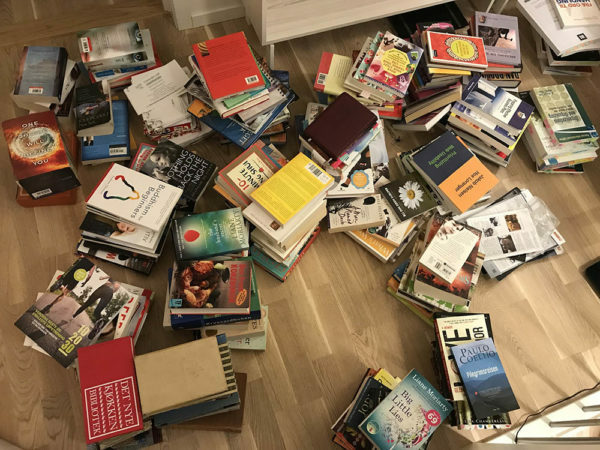 I do not have a picture of the library to share, because it is a mess. But I will be sharing it with you later. That was my organising. 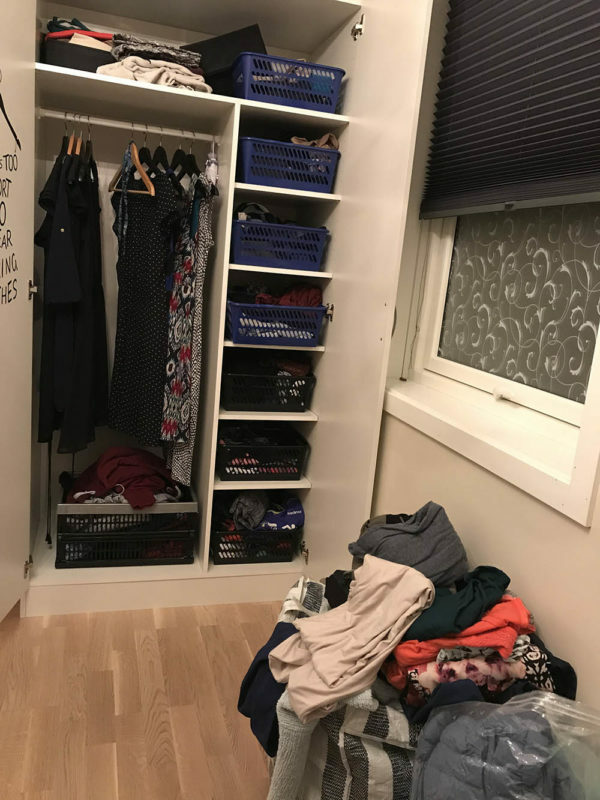 I would love to learn about your best organising tips when it comes to clothes or books, let me know in the comment below.